One thing I have noticed when running darknest rallies is that there are some people that are unsure, or unaware, about what to do to join a rally. Either the wrong troops are sent, t1/t2 troops are sent to higher level nest rallies, etc. So this is just a quick guide on how to successfully join a darknest rally (or any rally really) without having your troops sent back. Pay attention to which troops are needed for the nest. Some guilds will do this differently than others, but there are a couple of ways to check on which troops to send. 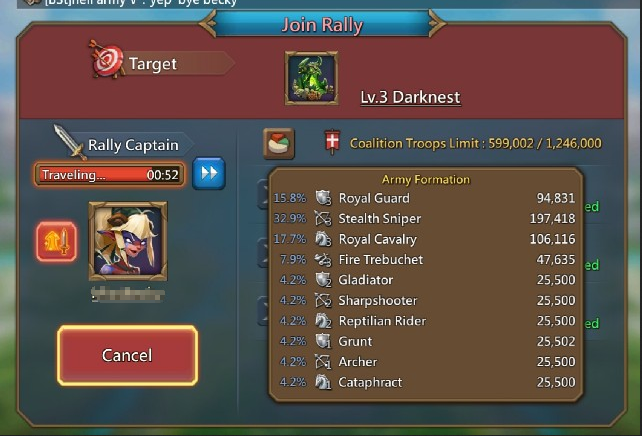 The rally leader will either post in guild chat what they need, or you can just send the same troop types as the rally leader with a similar ratio of troops. Troops being posted in guild chat can be done different ways as well. Some people will post four numbers to indicate the ratio of each troop type they want. 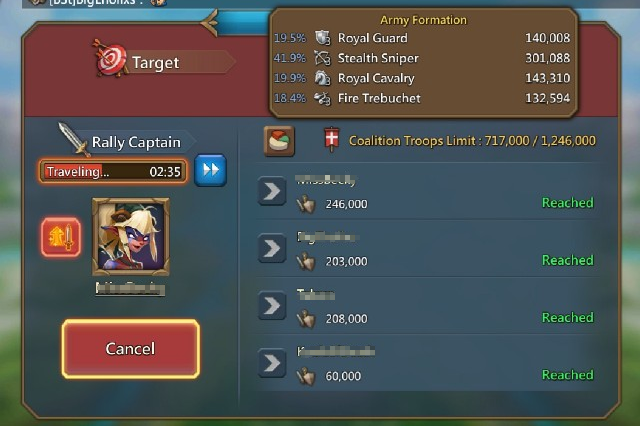 It looks like this, 2/3/4/1 and what this indicates is that they are asking for percentages of Infantry/Range/Cavalry/Siege, the numbers mean 20% infantry, 30% range, 40% cavalry, and 10% siege. The numbers should always add up to 10 to make sure proper ratios are being sent. Another way they may be posted is just posting in guild chat which troops are needed, which is what I usually do. Below I’ll post what either way looks like in guild chat. But what if the troops needed weren’t listed in guild chat? If the troops needed were not posted in guild chat, then another way to find out the troops needed is to look at the rally leader’s troops. You will want to send the same type of troops that the rally leader sent and close to the same ratio of troops. This is an example of what you would look at to determine the troops you would need to send. For this rally, I sent a lot of range. The ratio I sent was 2/6/0/2, because what I needed was a lot of range, and some infantry and siege. So as long as someone sent me mostly range and no cavalry, that was all I was looking for. Some rally captains are more particular, but that will just depend on their personal preference. In review, only send the troop types requested, and make sure you’re sending the appropriate amount of troops. 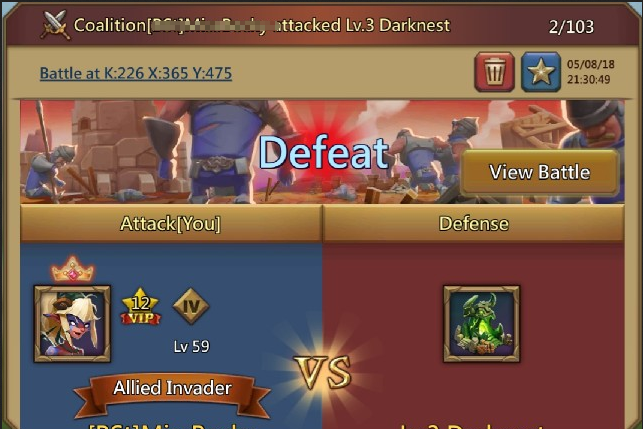 Don’t send lower tiered troops to higher level darknests. When sending troops to a level 3 darknest or higher, don’t send t1s or t2s because that is how darknests are lost. They are the troops that will get killed first, and they will quickly lower the morale of the rally which will result in defeat against that particular darknest. Which means everyone that joined the rally misses out on the essence. For this nest, I actually asked someone to send t1s and t2s when we would have normally won this nest to illustrate what they can do to a rally. 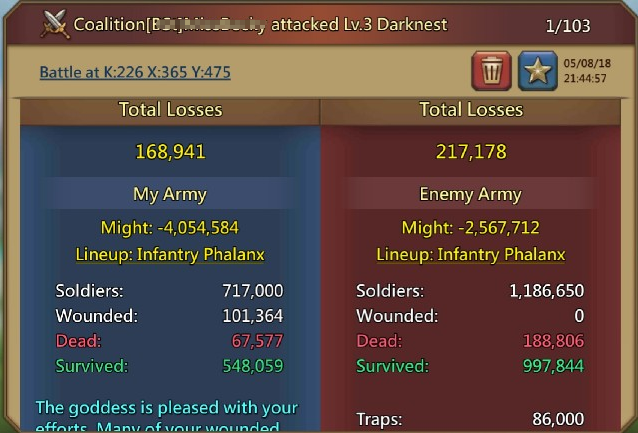 With this number of troops with a level three darknest, we would have normally won this, but because of the t1s and t2s we lost it. We won it right after, as you can see below. I used the same gear, the same talents, and used an attack boost for both rallies. However, we had slightly more troops the second time because someone added extra siege to the rally just to be sure we got through the wall. But winning a level three darknest with approximately 600k troops is easy with the right talents, research, and gear. 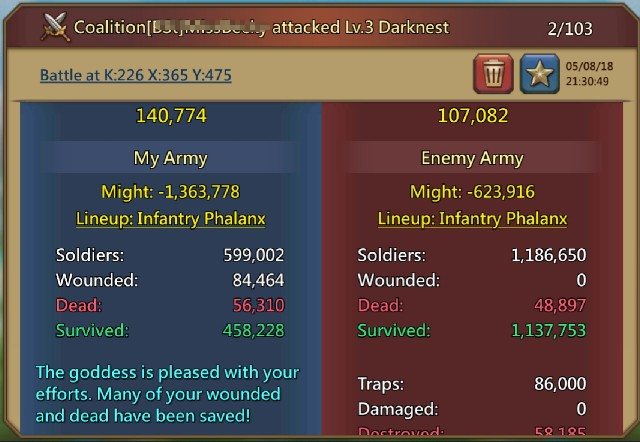 If we’d had the exact same number of troops, but just all t3, we would have won the first time. 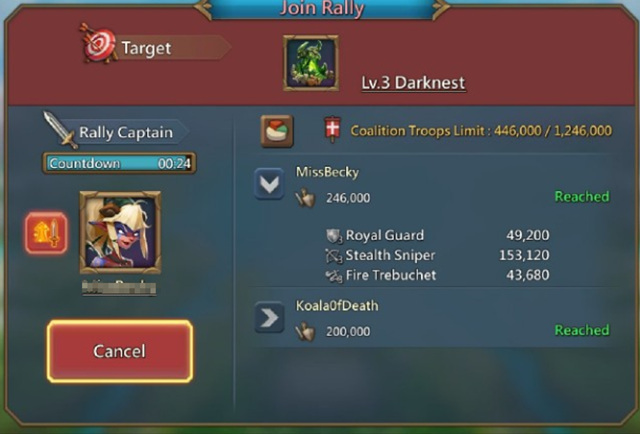 Again, this is why you really shouldn’t send t1s or t2s because you could lose the entire rally for everyone that joined. If you only have t1s or t2s send one t2 siege so that you can still get the essence. But no more than that. 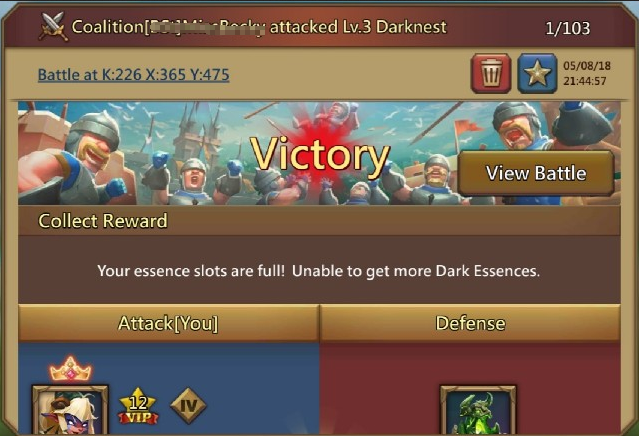 Leave space for individual troops so everyone can get essence from the darknest. This is more about just being polite than a hard rule. In my guild, we often times have darknest rallies that fill up within a couple of minutes, leaving everyone else that needs essence to have to wait for the next rally and hope they can join before it fills up. Something we usually will do is once we get close to filling a battle hall, we will leave at least 100 spots open for people to send one troop so that they can get essence. That means fewer rallies needed to fill up everyone’s laboratory. These are just the basics for darknest etiquette, but if you can manage these, you won’t have any issues with joining a darknest, and likely won’t be sent back by the rally leader again. If you have any other suggestions or things you wish people knew about joining a darknest, leave a comment with your advice. The best piece of advice or addition to darknest etiquette will get 500 points. If you know people that can benefit from this guide, share it with your guild so you can have more successful darknest rallies. Previous Previous post: Migration Scroll: But 800k Guild Coins is a Lot!